We had just climbed the small pass marking our exit from the Italian Dolomites and aiming us towards Austria when we happened upon a public climbing wall. Fresh from our Vie Ferrata experiences in Italy where we gained a new appreciation for the skills and strength needed in rock climbing, we took a spin on it. 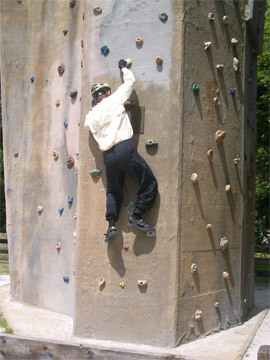 Bill on Dobbiacco's climbing wall. We were instantly pleased to discover that our stiff Shimano cycling sandals were better than our bigger toe-box boots for the small holds on a climbing wall. That meant we could mail our new boots home and still be able to enjoy the next climbing wall we encountered. Without the security of ropes to catch us if we slipped, we settled for repeating the lower holds several times instead of venturing very high. And we were just as happy to leave our bike helmets on for safety during this little adventure. We were delighted at the prospect of finding more such climbing walls in the weeks ahead as a fun way to promote upper body strength. But we'd soon discover that it was the only one on the route and we'd have to settle for chin-up bars, or makeshift substitutes, as we headed into Austria and then Germany. Yikes, but what a brutal day. Map Man had struggled to find a bikeable route north over the mountains to Berchtesgaden in southern Germany without going over the monstrous Gross Glockner Pass. Gross Glockner, which we crested several years ago, was challenging with its unexpected second summit, but it was the headaches from the sheer elevation in the 8,000' range that Bill wanted to avoid. But despite being at lower elevations which were kinder to Bill's head, Turracher Höhe (pass) must be the hardest climb we've ever done. The climb to the summit was only a little over13 miles, but the last 4 miles were mostly uninterrupted 10% or greater grades. Bill had asked the tourist info folks in the last couple of towns which was the best way to go and the last person strongly recommended this route as the one for bikes. Grades of 15-20% were shown for other 2 alternatives, and since our map didn't cite any grades on this one, we took the local advice. But 4 miles before the summit there was a sign warning of 23% grades ahead. We had no idea when or for how long that grade would occur. All we could do was gulp and continue up the relatively more moderate, but still steep, hill before us. We pedaled up some of the 15% grades but resorted to pushing up others. We could only push our 110-120 pound loaded bikes for 30-40 seconds before we had to rest for an equal length of time. On what must have been the 23% stretch that easily looked more like 30%, we pushed 2-to-a-bike and still had to stop frequently to rest. This process gave us a deeper sense of the struggle related in the stories at San Gottardo Pass in Switzerland--stories about the slow going of men and pack animals crossing the Alps with heavy loads. If our sweat and groaning wasn't testament enough to the relentless grades, the black exhaust streaming out of the tailpipes of many late model cars underscored the effort required by all. The smell of scorched auto brake pads was intermittently in the air from the folks easing their cars down the same hill. And walkers could have overtaken the few big trucks creeping down the slopes. Crossing cow fences instead of clipping onto Via Ferrata wires. Once over the pass and in the nearby town, a German woman our age gasped at our accomplishment and said that the steep grades had damaged their car. But she was more interested in talking about the bike trips she hoped to take than what was next for their auto, so we could only guess what unexpected direction their vacation now was taking. We were sorry to learn from the tourist info office at the summit that our next riding day would be similar to this difficult one. When Bill mentioned that we'd been directed this way by the other info office, the rep agreed that was a mistake, but now the only way out of this area was up another equally steep face. The planned couple of days off for hiking were looking like an even better idea as they would decrease the risk of shredding our knees or other joints under the strain. Though the relative-rest day was welcome, hiking in this region of the Austrian Alps just didn't measure up to our experience in the Dolomites. The broad mountains carpeted by grazing meadows and occasional clusters of trees lacked the drama of being surrounded by the pink and gray vertical faces that shot up from triangular swaths of scree bases. 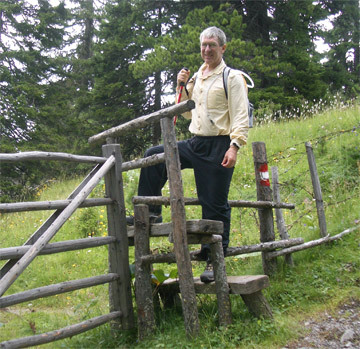 When not looking for secure footing for our next step in the Austrian mountains, we looked up to admire the scenery but there was little to grab on to--nothing to excite our minds or spur our curiosity. Even taking a single-seater ski lift above tree line didn't help as there just wasn't much difference between the mountains or valleys. Bill was anxious to do more hiking and yet the visual experience wasn't worth the penalty paid for packing boots in our panniers. Unlike our higher elevation hiking and Vie Ferrata experiences in the Dolomites, it was now looking like our Teva sandals would again be adequate for hiking. Yes, the extra traction the boots provided was welcome on the steeper slopes in Austria, but being shod only with our trusty sandals would not have held us back on that day. 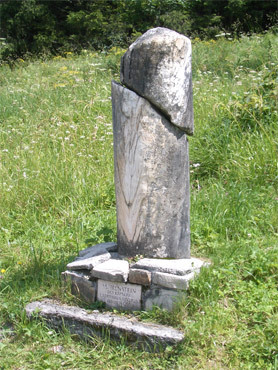 What's left of a Roman mile stone. Under-whelmed by our hiking day, we settled for 1 day instead of the 2 that Bill had planned and headed out to tackle the ominous second pass. Fortunately for us, none of the tourist info office folks in Austria were getting it right when it came to the steepness of the roads and the next pass was tolerable. It was hard, but in the range of what we expect from passes: challenging but still possible to pedal every inch of the way. And unlike on Turracher Höhe, we were able to stave-off our lunch-time hunger until we reached the top, one of our odd measures of a good day. The sight of a few preserved Roman mile stone markers along the way reassured us that indeed, this was probably the best route through the area for us. We saw fellow cyclists in the Dolomites, but they were usually male riders, often members of a cycling club sporting matching Lycra outfits. A few small groups of riders were supported by a van and rarely we saw loaded cyclists in the Alps. But as soon as we were within a few miles of the Austria border, the profile of the people on bikes shifted dramatically. Instantly cycling moved from the domain of the elite, lean, racer-type on a featherweight bike to the world of 'biking is for everybody'. Suddenly women were out in numbers and the groups were more often families than all-male clubs. Sturdy mountain and cross bikes with big tires and butterfly-shaped handlebars displaced the racing-style bikes as the preferred machine. 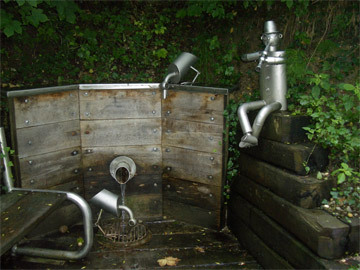 Public art at an Austrian bike route rest stop. And after we left Turracher Höhe behind us and we entered the lake district in Austria, the number of differently-abled folks on bikes also shot up. In about a 10 minute span of time we saw 2 young adult males with physical challenges on bikes. One fellow had a significant problem with involuntary head movements and was on the back of a tandem, perhaps with Dad. His head was in constant motion but he succeeded in keeping his torso still and kept those legs going 'round and 'round. The other guy we saw was clearly mentally disabled but was whizzing along with determination on a 3-wheeler with a nearby companion on a 2 wheels. It was very touching to see the results of undoubtedly a lot of effort expended to get these 2 guys on bikes and give them the extra training they needed to make them successful. It seemed to be a reflection of the importance of biking in these central European countries and that if you are going to mainstream challenged individuals, a priority is to get them on a bike. And how wonderful that despite their challenges that they were enjoying the thrill of creating speed and the sense of exhilaration that would be hard for them to experience any other way. We've always marveled at these European kids and their biking skills and like with her, wondered how they acquired so much endurance and focus at such a young age. We always assumed that they got some of their balance sense from riding on the fronts and backs of their parents bikes as soon as they could hold their heads up. And we'd also noticed that bikes for really small kids were readily available in Europe--none of this waiting 'til they are 6 or 7 years old. Of course, having lots of off-street bikeways gives them somewhere to practice, unlike in the US. Already a pro at 3 1/2 on his no-pedals bike. 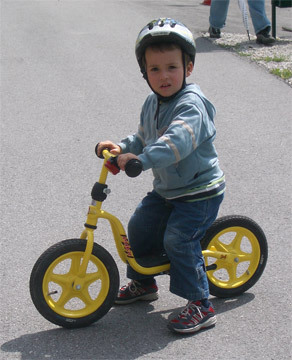 But our notion of how these little kids came by their bike handling skills was radically changed by seeing a little guy on a little bike with no pedals. He cruised along like a duck paddling in the water, just like the only way to ride a bike was by propelling with your feet on the ground. He'd get a little speed and hold both feet up in back and coast along. After asking his folks for permission to take his photo, we learned that he was 3 1/2 years old and had been riding since he was 2. How incredible to be learning biking etiquette, developing balance skills, and navigating sidewalk traffic while he was learning to walk and talk. A week later the accessibility of biking in Germany was underscored in a tourist office brochure describing the sights and services available--a brochure that also included a bike shop serving the disabled. Accessibility needs were also addressed for several seniors who had cane holders on their bikes. They had 2-point systems with a clip on the handlebars and a little cup near the ground to hold the cane tip. And there seemed to be a solution for every situation needed to get or keep people biking. There was the young man not quite doing his share on a side-by-side, 4-wheeled tandem. And one older man was cruising a bike path in his electric wheelchair, presumably with his wife along side on a bicycle. On the same path, a woman out with a group of friends had her dog in basket that had a special wire cover to keep Fluffy from making a run for it. 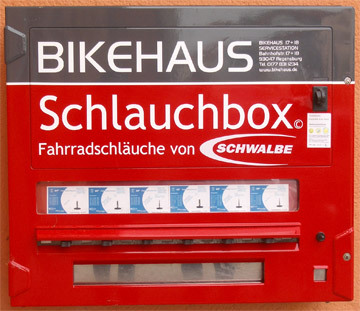 Free "Radler Boxes" for secure bike & gear storage in town. Though not yet in need of special solutions to be able to bike, we were direct beneficiaries of the strong biking culture with the availability of thousands of miles of posted bike routes in cities and between them. And the welcome mat was out to cyclist's at many lodging establishments as expressed by special "Bed & Bike" banners or "Bikers Welcome" flags. A couple of hotels went as far to list bike service as one of their amenities, though we didn't know if that meant they had a pump to use or if Dad had a bike shop next door. 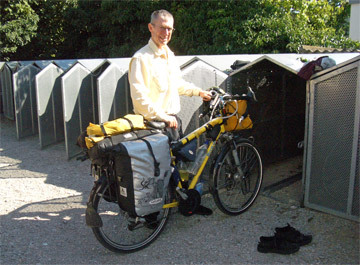 And more than one town along our route had centrally located, free bike lockers available that were wide enough to effortlessly accommodate a loaded bicycle. Thoroughly enjoying the pro-bike culture, we continued our mostly northward journey towards Berchtesgaden, Germany lingering long enough to revisit the Celtic museum in the ancient salt mining city Hallein, Austria and to visit a few other historic sites. 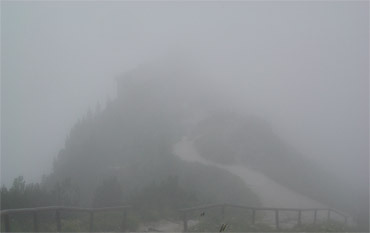 Not such a good day for views from Hitler's Eagle's Nest. From there we headed to Salzburg, beginning a week or more of repeatedly crossing the border between Germany and Austria, sometimes several times a day. We often didn't know which of the 2 countries we were in at any given moment as the borders weren't marked and our route was driven by the best bike paths and not any national loyalty. Salzburg is always charming but it being in the throes of its annual summer music festival made it a bad time for us to be there. We retreated to less expensive and less charming lodging in the suburbs after touring the old town on our bikes in the drizzle and headed out the next morning. Dense clouds and heavy rains deprived us of experiencing the spectacular mountain views from Berchtesgaden and the same nasty weather compelled us to lay over an extra day in the nearby city. We hoped that the storm would pass overnight but the glum forecast was proving to be too accurate. We reconciled ourselves to bundling up for the worst and finally headed out into the relentless rain to continue our journey. It was slugs and snails dotting the paved paths before us whereas in Italy it had been the darting by of a little lizard that caught our eye. One of many "High Water" signs. We'd had an unusually dry riding season this year and these early August days were probably the first for which we "suited-up" from the get-go and began the day in full rain gear. Other days we'd been rained on, but only part of the day and only after we were well underway. And ironically, it wasn't until August that I dug-out my new, heavy duty rain jacket purchased for 2006. It's always hard to motivate ourselves to step out into the rain first thing in the morning whereas it is so much easier to shrug our shoulders and cover up for a mid-day storm. There is a huge difference in comfort too. Riding in rain gear for 2 to 3 hours is fine. But as the hours wear on, the gear gets less comfortable. The breathable fabrics eventually get overwhelmed and begin getting clammy inside. Our homemade waterproof overmitts are imperfect, so after several hours the fuzzy gloves inside them start getting soggy. Places where we didn't notice water creeping in earlier become revealed after a few hours, like around the neck and cuffs. Just how bad it was for riding the day we left Berchtesgaden was underscored by not seeing a single person on the usually well-traveled special bike paths in the morning. On a Sunday in August in Germany that was truly shocking. We were definitely out there alone as not even the ducks or swans were to be seen. We found a deep bus shelter in which to eat lunch and mop-up a bit, but as usual after stopping to eat our picnic lunch on a rainy day, we got chilled. Sitting still in sweat-dampened clothing takes its toll, despite putting on a dry shirt or socks or adding another layer. And even with water proof gear, riding in temperatures in the high 50's can be chilly after several hours. Churning of the usually serene Saalach River near Salzburg. We bit our lips and bravely headed out into a downpour on the second morning, but were lucky to have a temporary shift in the weather system by noon. Any break is better than riding all day in the rain. CNN's general European forecast said nothing about the heavy rains creating a risk of flooding and instead commented that they would only slightly diminish the drought, of which we were unaware. 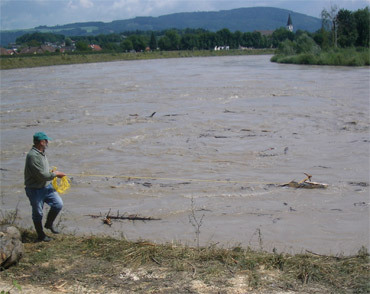 But having narrowly escaped the Central European flooding in 2002, we were still apprehensive. We kept a close eye on the fast moving Saalach River whenever we rode past it on the way into Salzburg. The large amount of floating tree and dead brush debris indicated that indeed the water level was higher than normal. And the odd and ends of other floating refuse, like a bike wheel and plastic buckets, underscored that the water was whipping around where it didn't usually go. We didn't need a sign to know this Salzburg bike path was closed. We stopped as another biking couple had already done to peer at the churning rapids the color of chocolate milk. The river was loaded with topsoil and unusually active. As we slogged along in the steady rain and occasional downpours, we noticed more and more people hanging over the edges of bridges to have a closer look. There was nothing to see but the water and we assumed they were making their own assessments as to the risk of flooding. The other disturbing indicator of things being amiss was the smell--that turn-your-nose-away smell of sewage. We were left to wonder what the source of the persistent aroma was. Given that it occurred over several days and along a number of different though linking waterways, we decided that it was less likely an isolated sewage overflow and more likely the affect of numerous pasture lands being flooded. It did have that pungent "farmy" aroma that is so familiar around cow barns and pastures. "Is it too deep?" we all asked. "Yup" reported back scout'Bill. Regardless of the lack of acknowledgement in the international weather report in the evening news, the next morning we began encountering flood waters on the bike routes. 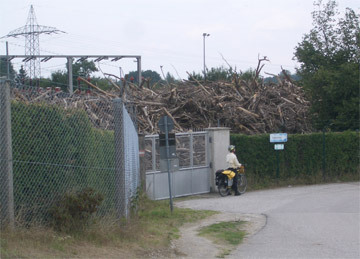 The first encounter was a local bike path in Salzburg that was barricaded. 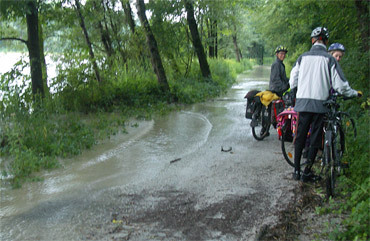 The next 2 flooded bike routes were intercity ones not yet posted as closed. All 3 flooded paths conspired to add many extra miles to our riding day as we had to backtrack and develop our own circuitous detours of several miles each. As the day wore on we saw other signs of high water, with the most intriguing being the harvesting of drifting timber during a break in the rain. We and 50-60 others watched the enterprising 30 or so people as they harpooned floating wood at a river bend. For some it was a family affair with the parents and 2 or 3 children helping out. For others, it was an activity shared with a couple of friends or perhaps adult relatives. A successful catch of floating timber with a grapnel. All of the wood gatherers had the same 4 pronged, wooden grappling hook with a slender but long plastic cord attached. An adult would fling his or her hook towards a promising passing branch or trunk and start pulling it to shore with the rope. Others would assist by latching on with a second grapnel or with a long handled pike. Once close enough to grab with hooks, the trophy would be hoisted onto shore and cut into about 4' lengths with a chain saw, then tossed on their private stack behind them. We watched the spectacle for close to an hour and still weren't clear as to their decision criteria. Usually the really big pieces were ignored, though we did see several 15-20' trees snared. Smaller, 6' lengths seemed to be preferred, though not all that size were targeted for grabbing. Looking at the freshly cut cross-sections confirmed that they indeed were securing good, fresh wood as none of it looked rotten. Presumably it had all been uprooted recently, though far enough upstream that it was almost all stripped of bark and branches by the time it reached their bend in the river. 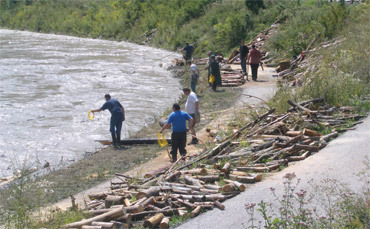 Entrepreneurs with their high-water timber harvests. The effects of the high water were still an issue for us for the next several riding days even though the rain became more intermittent. One morning we just barely navigated around the receding water on a through road. Later that afternoon, we were lucky to traverse a paved bike path just as the huge bulldozer and sweeper were finishing their clean-up job, only to discover the path was completed closed by landslides a quarter of a mile on. The marked and unmarked detours and repeated backtracking due to high water caused us to fall short of our destination several days in a row. Despite being slowed down by the floods, we intently focused on all of the effects of this big weather event We marveled at one monument to the high water--a monument that was literally forming before us. There was a huge accumulation of wood against a dam itself on the Inn River and the even bigger pile of wood on land that had been removed from the accumulation in the water. Crews were busy chipping and grinding the timber but there was already quite a backlog. Wood removed from the dam & destined for the chipper. As in prior years, we marveled at the more permanent monuments to the high water events, which were the marks on the outsides of buildings--or even inside sometimes. 1845 was the year of the deepest water, with the line drawn being well above our heads as we stood at the foundation of one building. The cresting of the flood waters of 1999 ran a distant second. We were surprised to see that August 2005 water line was higher in some places than the flood of 2002 that we were mired in. We were in Serbia and Bulgaria during the floods last year and only were aware of the local problems with flooding at that time. 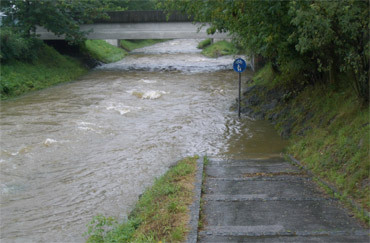 Due to the lack of TV news, we entirely missed the severity of the high water farther west in Germany. The Hochwasser of 2006 probably won't make it on to anybody's wall markings, but we will remember it as the flood we could linger to photo. 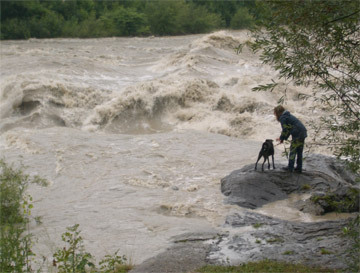 During the 2002 flooding, we high-tailed it out of the rapidly rising water area in the Czech Republic as fast as we could and forgot to document the experience. The slackening in the rainfall assured us that the "hochwasser" or high water threat had finally abated and we turned our attention to the fun of being surrounded by other cyclotourists. When we were in Passau, there were almost always cyclotourists (not just cyclists) in sight at any given moment, either cruising along the streets or parked in front of a sidewalk cafe. Even midweek, the train station was swarming with those beginning or ending their tour. Historic Passau is at the junction of 3 rivers: the Inn, the Donau (Danube), and the much smaller Ilz and the city itself looked like the cyclotouring hub for Europe. Passau is also the intersection point for no less than 8 different bike routes. It pulls cyclists in from all directions, including cyclists from Switzerland that can take a fairly direct river route to Passau. Inner tube vending at the Passau train station--6€ each. Passau is clearly accustomed to its role as host to the cyclists, with bike-friendly accommodations and plenty of well stocked bike shops. Even the main train platform at Passau had a bike lane painted on it--something we hadn't seen anywhere else. And for the unlucky, they had their choice of 6 different replacement inner tubes from a vending machine next to the one dispensing cigarettes at the train station, also a "first" for us to see. And it is along rivers like the Inn and the Donau and in places like Passau that we see the hoards of bike travelers that we affectionately call "Donau Riders". Though cyclotouring in Germany is an activity as likely undertaken by a 75 year old couple as a 25 year old pair, our stereotypic Donau Riders are somewhat overweight, late middle-aged couples or packs of couples, sitting upright on their bikes without the paraphernalia that we consider essential to cycling: helmets, sport sunglasses, waterproof panniers, and pedal systems that lock your shoes onto the pedal for more efficient riding. Donau riders are more often in baseball caps and Birkenstocks than helmets and cycling shoes. These folks, unlike us, have likely considered bicycling a part of their daily lives since they were kids and don't bother with these accessories we consider central to the sport. And on the road, some Donau riders look like they are very careful not to break into a sweat and are quick to spring off their bikes that lack a cumbersome top tube to push instead of pedal at the slightest of provocations. Others are hardy riders and experienced climbers that join us in powering their loaded bikes up 10% grades on the route. For the Donau Riders, a big sturdy bike that they can step through like a girls bike, perhaps with the big butterfly handlebars, and 7 speeds is the proper way to tour the rivers. The 'newbies' will likely have their gear stowed in a backpack in the big wire basket on the back of their bike that they use for daily shopping at home. The fully-outfitted Donau Riders will have a pannier system we we consider our worst nightmare: a pair of rigid fabric bags with an integrated suitcase-shaped 3rd bag that spans the rack and the tops of both side bags. From experience, we know that having so much luggage weight up so high and so wide creates a bike handling problem. And no doubt, they look at our less convenient, lower-riding, waterproof bags and shake their heads in disapproval. But of course, we all have selected gear to fit our needs and their riding that is primarily along flat river routes entirely out of traffic doesn't put as much pressure on biking handling. We need superb responsiveness and predictability on our bikes as we end up riding in a huge range of conditions that includes infrequent bouts with snow, ice, sand, mud, deep gravel and the challenges of narrow bridges, intense urban traffic, and high mountain passes. In contrast to the States, the more universal nature of cycling is underscored in Germany by some of the riders stopping for a smoke or the larger number that take in a beer mid-ride. And the extra weight of a Thermos with coffee for each rider tucked into the pouch on the backend of the pannier doesn't seem to warrant a second thought for a Donau Rider. In the early days of August, the rains that eventually flooded the regional rivers were seemingly non-stop--the only thing that varied from hour to hour was the intensity. Then the pattern shifted towards mid-month to one of afternoon storms. Our bias towards being off the road by 4 pm or so fit well with this weather pattern and we rarely got wet in the near-daily storms in the middle of the month. By the end of August, the pattern had again changed, this time to one of multiple but usually brief, downpours. Instead of refining our skills for riding in 90° heat as we usually do by the end of August, this year we were instead refining our ability to read and dodge rain clouds. There was an endless band of storm systems coming from the northwest every time we checked the 10-day forecast on the web. There was no ignoring it, it was going to be cool and wet for weeks. Just time for an afternoon celebration before the next downpour. These late August storms that were brief and fast required a new strategy: instead of cladding ourselves in Goretex and pretending we were having fun as we rode in the rain, most days we opted to sit it out the downpours. Sharp winds would suddenly be added to the persistently overcast skies, prompting us to look for the dark clouds if we hadn't already spotted them. We'd pause while Bill made his prediction as to whether the black mass would go over us or bypass us. We'd keep pedaling until the first drops of rain were lacing the winds and then it was time to look for serious cover. Sometimes that would mean backtracking to a choice bit of shelter we'd recently passed. If we were out on a riverside bike route when the dark clouds approached, we'd begin heading for the nearest village or farm structures on the horizon. If we were just leaving a village, we'd turn back to wait out the storm. Early in this new weather pattern, we made the mistake of thinking that the leading edge sprinkles were all that were coming and got soaked in a sudden, drenching rain before we could find shelter or put on jackets. It was one of the many cloud bursts where the water sheeted on the streets and people indoors pressed to the windows to see the spectacle. After that, we erred on the side of parking too early rather than too late. After that, we become connoisseurs of rain cover. Key to a piece of temporary property for us was something with a back wall into the wind. We hoped for a 3-sided shelter to shield us from the chill and wet of the inevitable changing winds. Likewise, the swirl of the wind generally required a fairly deep space for us to avoid the spray. Then of course, a bench was highly desirable inside our rain shelter. Our 2 most common storm shelters in southern Germany were house-like bus shelters with good orientation to the wind and school building doorways. Schools were good for several reasons. 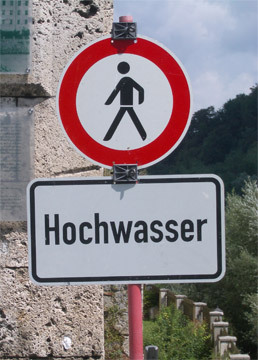 Unlike the coveted high-end bus shelters, villages would have signs pointing the way to the local "Schule". Schools also allowed for some shopping opportunities as we could circle around the entire building looking for the best doorway or nook with an overhang that offered excellent wind protection. Fortunately for us, school was still out for the summer. The entertainment selection that we dug out of our panniers for our bivouac became more elaborate as the days of sitting out storms progressed. First, we'd just sit or stand and watch the passing weather. After a couple of days, we started pulling out our handy books to read. Another day, we opted to use our bike inner tube exercise bands to pump a little "iron", which both helped to pass the time and generated some welcome body heat. And one day when we expected a protracted storm with several waves, we dragged out the computer along with extra clothes to both wear and pad our rear-ends while sitting on the doorway concrete. 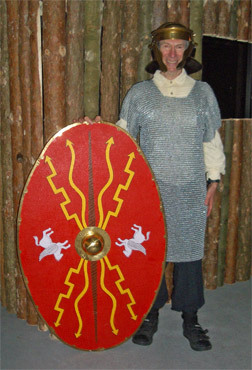 Re-experiencing the pounds he shed with the help of a museum's Roman chain mail replica. Some days we'd sit out 3 rounds of storms, including delaying our departure a couple of mornings. Lunch became synchronized with the weather more than our hunger, as we could enjoy our picnic in the time it took for a storm to pass. One day we were fooled however, as the storm didn't pass in the usual 30 minutes. We read for an hour and finally suited up as it was getting late. It was the right decision, as that storm lasted over 3 hours--too long to wait. At least we had sat out the "gulley-washer" stage and the worst of the winds. And of course, we occasionally set-up camp to wait out a wave of water that never developed, though we considered the few over-calls as acceptable penalties for the ones we did avoid. One of the problems with sitting out the storms was the effect on our dieting. Sitting out 2 or 3 waves of storms could delay arrival at our destination by an hour and a half or 2 hours. Instead of hanging it up by 4 pm, we were often still out on the road at 6 pm. Our lunch calories were doing little enough to support us by 4 pm and so we often resorted to dipping into our unbudgeted snacks to complete the day's ride. The late-in-the-day effort left us in no mood to deduct calories from dinner, our smallest meal of the day, so the day would close with more than our ideal amount of consumption. It was only a couple hundred extra calories and it would hopefully be for a limited amount of time, but it underscored the challenges of weight loss or even control when cyclotouring. (For more on our diet and our successful 2006 dieting regime, check-out "Weight Management" in our "What, How & Why" folder.). 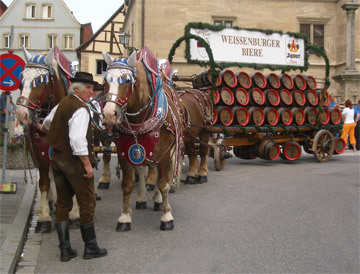 Our August travels into and through southern Germany had several rhythms. There was the overwhelming presence of the rain that transitioned from steady, heavy rain that created the flooding; to the late afternoon storms; and then the off-and-on downpours. Another rhythm was the affect of the terrain on our cycling day. Early in August we were in hilly terrain, despite traveling along river valleys most of the time. We still found ourselves doing short bouts of 10 or 15% grades as the bike routes looped around obstacles, over to the next valley, or up to a historic site. And though we weren't doing the sustained climbing we do in the mountains, we were still accumulating a surprising amount of elevation gain each day. Unusual river riding: high water & occasional steep grades. About the time that the storms became mostly limited to the afternoons, we were on flat river routes. That made for easy riding but unless the river paths meander through villages or other lively areas, they can be pretty boring. We'd learned in the past that it was time to turn our attention from the landscape to our cycling technique for some of our daily entertainment. Focusing on the details of technique would offer brief distractions for our restless minds, so we looked to displace bad habits with new resolve for better form. For both of us, an important lapse in technique is always in shoulder position. In cycling as in everyday life, the shoulders tend to creep up around our ears, like with most people. "Shoulder blades down, breastbone forward, neck long" became the mantra. In addition, for Bill, restoring the easily lost but desirable curve in his low back is a constant challenge; for me it is prodding my lazy left leg to do its share. We both tinkered with hand and head positions and experimented with changes in how we sat in the saddle. This year Bill had a new resolve to walk, hike and ride with greater vigor to support his weight loss program and his commitment was startlingly apparent when we rode 'on the flats.' In August, he was able to increase his average pedaling speed 20-25% over what he'd normally do in similar terrain. These river routes were an exceptional opportunity for sustaining riding speed as we could ride long stretches with little terrain variation and without having to slow because of traffic or obstacles. It was exhilarating and an unexpected thrill to take our riding to a new level. Riding at a faster clip did throw the Map Man side of his personality into chaos however as day after day we were getting to checkpoints on his planned route much sooner than expected, often causing him to briefly lose track of where we were. But like the weather patterns, the terrain patterns again shifted and next left us in a 'start-and-stop mode' as we threaded our bikes around barriers, made sharp right-angled turns on steep slopes, and tried our best to decipher confusing route signs. We found the sightseeing opportunities in southern Germany in keeping with the landscapes: pleasant but not exciting, despite Map Man's nightly ritual of sifting through the guide book and tourist info brochures. I kept offering that it would all look better with a backdrop of blue skies, but it was hard to keep repainting the picture in our minds. 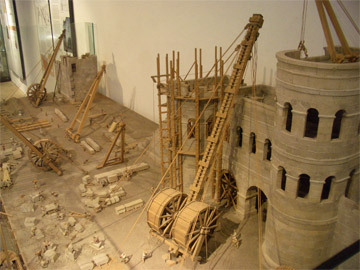 Another wonderful model: Roman construction at Regensburg. The burden fell to the Romans to provide the main theme as we pedaled across Bavaria and stopped in for a look at the museums and fine old towns in Passau and Regensburg on the Donau. 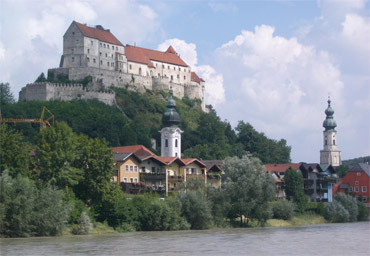 Regensburg was the eastern terminus of the Limes ("lee-mus"), the Roman road and later a wall, designed to mark their territory and keep the barbarians at bay. Some of the little museums along the way deepened our understanding of the 350 mile wall itself and life in the northern territories in the 60 some forts and 900 watch towers. We stayed 6 nights in Nuremberg, longer than anywhere else, in part to use it as a launching point for an overnight trip to Berlin to see a temporary exhibit of Egyptian underwater archeological finds. We enjoyed being back in Berlin more than we enjoyed the exhibit and felt lucky to just miss Berlin's rain shower that occurred while we were dropping off our backpacks at our hotel. Nuremberg's old town was hit hard in WWII by Allied bombers, in part as punishment for being the site of the Nazi party rally grounds. Our revisiting of the Documentation Center that exposed the roll of the Nazi rallies in their larger PR strategy was one of the highlights of Nuremberg; the other being the guided tour of the subterranean beer cellars that were converted into art storage bunkers before the war even started. This bunker system was complete with temperature and humidity control systems and a round-the-clock staff. Several of the city fathers predicted the punishment that would ultimately come and began protecting and stashing the city's finest art, as well as squirreling away casts of architectural details years before the destruction. So, much of Nuremberg's old town is newly constructed, but very authentically. Half-timbered buildings with rosy sandstone. In Nuremberg and some of the other cities we were amused at how often we heard Italian spoken by fellow tourists. We always enjoy our time in Italy and hearing the language in the background put smiles on our faces. Nuremberg's warmth came from another source too, it's favorite building stone. 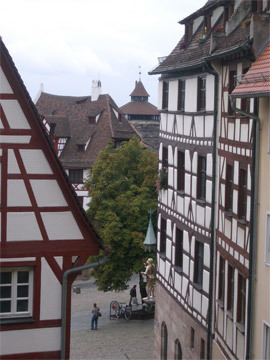 The original old Nuremberg and the rebuilt old town contained an abundance of the local deep, heathery pink sandstone. And as we meandered northwest out of the city, we spotted the same appealing, softly textured stone again and again, including being used as facing for massive freeway piers that towered high above us. The recent, less than stellar weather and sightseeing hadn't flooded our minds with new input but left us with more time for ruminating on secondary issues. In particular, spending a day reviewing the Nazi's rise to power from the perspective of the events in Nuremberg and then watching a 2 hour CNN special on bin Laden had us drawing comparisons. Reading the chronologies of the curtailment of individual liberties in Hitler's era once again prompted us to review how far Bush has traveled on the continuum with his post-9/11 policies. Of course, Bush's measures pale in comparison to Hitler's, but we considered the fact that the question even came to mind as significant. bin Laden isn't in a position to set government policies of any kind, though he does believe that non-believers of his faith have forfeited their rights to life. And of course, Hitler viewed millions of people as unfit for life, including many of his own people. I was amused to discover that we weren't alone in pondering these similarities. A casual conversation with an older Eastern German man on the street turned into an uninterruptible monologue after he learned we were Americans. Bill couldn't keep up with the details but even I understood his protracted comparisons were between Bush and Hitler. The chaos in Iraq that is faithfully reported in detail each evening on the news became even more discouraging when we learned more about early 20th century Germany from our DVD lecture series on Hitler's empire and from the museum exhibits. In the early 1920's when the new democracy in Germany was failing miserably and thugs from the many political parties terrorized people on the streets, Germany had one of the most highly educated populations and had one of the most prosperous economies in the world. We couldn't help wonder that if democracy in a flourishing Germany couldn't prevail over the civil unrest, how can it possibly succeed in Iraq? These wandering and ponderings of our minds underscored what is said by many about the benefits of traveling, that traveling opens one's mind, broadens your view, and changes your perspective. And these musings once again emphasized to us how our travels have given us a new understanding of our country and culture--along with sometimes learning more than we care to know about what others think of us as Americans. We've just arrived in Frankfurt in western Germany a few days ahead of our departure from their airport to Portland. We will fly home on September 28 for a brief stay of just over 1 month. Early in November, we'll head off for a 4 month visit to New Zealand. We shaved off the Australian part of our first 'down under' tour to economize both on the expense and considerable bike transport hassles. We will return to Portland on March 1, 2007 for our annual longer stay before heading back to Europe again.